A trio of today's finest bolt-action rimfires. Nearly all the centerfire rifles I own are no-nonsense hunting tools. Designed for rugged utility, they wear unadorned gray or black synthetic stocks. Toted in saddle scabbards or carried through the woods, they are largely immune to the nicks, knocks and scratches hunting rifles invariably fall prey to. For several years now, my yearning for nicely figured walnut and hand-cut checkering has been satisfied by several high-grade rimfires. While I regularly use these rifles for small game hunting, plinking and target shooting, it's easy to handle them with care. They aren't exposed to the same kind of abuse in the field my centerfire rifles sometimes suffer. A longtime fan of .22s, I shoot these rifles a lot more often than I do the centerfires in my safe. I also consider top-quality .22s to be a truly worthwhile investment. The extra dollars they cost pay off in added joy and pride of ownership. While a handful of top-quality .22s are currently available, this wasn't always the case. When Winchester phased out the famed Model 52 sporter in 1961, many shooters thought it marked the end of an era. At the time, it was the only high-grade .22 bolt action on the market. Remington's 513-S had been dropped in the '50s, and the 40X sporter didn't come along until 1969. It was a Remington Custom Shop model and only a handful were made each year on special order. Anschutz rifles started showing up from Germany in the early '60s and were the only carriage-trade production rimfires remaining in the American marketplace through the 1970s. When the Kimber Model 82 first appeared in 1980, it reawakened America's interest in truly excellent .22 bolt rifles. While Model 82 sales were strong, the Kimber of Oregon company fell on hard times and eventually halted production. The company's successor, the current Kimber Mfg., Inc., first focused on top-quality 1911A1 pistols at very competitive prices. These handguns were--and remain--extremely successful. Then in 1999, Kimber introduced the 22 Classic--welcome news for bolt-action rimfire fans. The Kimber 22 Classic outwardly resembles the original Model 82, but it incorporates a number of new features and improvements. It has a Mauser-inspired bolt with a full-length claw extractor and controlled-round feeding. The neat two-position wing-type safety is similar to that found on the Winchester Model 70. G. Anschutz GmbH & Co.
Folding rear sight, hooded ramp front sight, Kahles 2-7x36mm rimfire scope mounted during test. Like many centerfire varmint and target rifles, the Kimber 22 has a pillar-bedded action, along with a bedding block to further increase stability. The bolt body rides slightly above the bore line, allowing the firing pin to be centered instead of mounted offset in the bolt like most .22s. The firing pin is also larger and stronger to prevent possible dry-firing damage. The 8-groove barrel is reamed and lapped, and features a match-grade chamber. Two highly experienced competitive shooters helped design the Kimber 22 Classic. Nehemia Sirkis, a well-known firearms designer, had competed in two Olympics as part of the Israeli rifle team and earned seven national championship shooting titles. Vladimir Polosin, the other key designer, won numerous European and international championships and formerly coached the Ukrainian Olympic team. Their goal was to create a top-quality, exceptionally accurate sporting rifle. They succeeded. Before being shipped, each Kimber 22 must shoot a 50-yard, five-shot group that measures less than .400 inch with match ammo. The test target is packaged with each rifle as proof of this accuracy. One of the most highly prized .22 rifles I own is a Model 1710 D Anschutz that Dieter Anschutz presented me several years ago as part of a writing award. This handsome German-made rimfire was built on the same Match 54 action featured in the Anschutz target rifles that have dominated national and international competition for more than 40 years. Anschutz rifles have won more Olympic medals and world accuracy records than all other rimfire rifles combined. That same heritage is evident in the .22 sporters Anschutz offers. My Anschutz .22 has a Meister-grade walnut stock with a Monte Carlo comb and rollover cheekpiece. It also wears a rosewood-capped pistol grip with a hand-filling Wundhammer swell, meticulous skip-line checkering and a distinctive schnabel fore end. The rifle has an exceptionally fast lock time, and a trigger that's adjustable from 2 to 4 pounds. The trigger on my rifle breaks cleanly at 2 1/4 pounds. Displaying Old World craftsmanship and attention to detail, the Model 1710 Anschutz is a true rimfire classic. I also own a .22 Hornet version of this same rifle. Both are among the most accurate rifles in my gunsafe. Cooper Firearms has been producing top-grade rimfire and centerfire rifles since 1991. In 2000, Dan Cooper replaced the company's excellent Model 36 .22 with an all-new rimfire rifle. "The 57-M is a rimfire design I've been working on since 1998," Cooper told me. "It's the rimfire action I've always wanted to manufacturer. This rifle blends the firing mechanism of the Anschutz 1700 series, the extraction system of the Winchester Model 52, and some of the looks of the original Kimber M82. The trigger is one we've used for the past 11 years. It's similar to the Pete Grisel trigger found in the older Kimber M84 rifles. The trigger is fully adjustable, and we set it at the factory for a crisp 2 1/2-pound let-off. None supplied, Burris 3-9X Fullfield II scope mounted during test. "To disassemble the bolt, you simply decock and unscrew the shroud. The entire firing mechanism can then be pulled free. We reduced the weight of the firing pin and added a stronger, faster, shorter firing pin spring," he added. "Internal surfaces of the bolt are not only drilled, but also reamed to reduce drop resistance. All this was done to drastically reduce lock time and deliver consistent firing pin impact pressures, which helps ensure consistent primer detonation." Cooper's precision match barrels are rifled with a 1:16 twist, and are air-gauge inspected and certified. The rifle features a massive recoil lug system originally designed by P.O. Ackley. Glass bedding is used behind the recoil lug, along with an additional bedding "pillow" under the barrel an inch forward of the breech. The barrel is free floated. All component metal parts are CNC milled from solid bar stock. With Federal Gold Ultra Match UM-1 ammo, the Cooper M57-M is guaranteed to shoot 1/4-inch 5-round groups at 50 yards. Before it leaves the factory, each rifle must shoot even tinier 1/8-inch 5-shot groups, as proven by the test target shipped with the rifle. This testing is done from a sandbagged bench at 46 yards, with a Leupold 36x scope mounted on the rifle. The Kimber 22 Classic and Anschutz 1710 D reviewed here are from my personal collection. I own a fine USA Sporting rifle Cooper and Anschutz teamed up to produce in the mid-1990s, but it's not representative of the latest Cooper lineup. For this article, Cooper loaned me a new Model 57-M Custom Classic to shoot and salivate over. I had also requested a Sako Finnfire Sporter, which is now marketed by Beretta USA Corp. When it arrived, I discovered "Sporter" was Sako's designation for a bull-barreled target rifle featuring a heavy match-style stock with adjustable cheekpiece (see sidebar). I tried switching it for the Hunter model that more closely matched the other rifles in this review, but the replacement didn't arrive in time for my deadline. When I used an early Finnfire a few years ago, I was favorably impressed with its accuracy and construction. While pride in appearance is why most of us buy a high-grade .22, accuracy is also important. All three of the rifles reviewed here must meet rigorous accuracy standards and are routinely test-fired before they leave the factory. These tests are conducted under controlled conditions in a wind-free shooting tunnel. To see how these rifles would perform under real field conditions, I took them to my desert range where erratic wind gusts are always a factor. Firing was done from a sandbagged bench at 50 yards, using four different .22 LR factory loads--Federal Gold Medal Ultra Match, Remington/Ely Club Xtra, Lapua Super Club and Winchester Super Silhouette. Three sets of targets were fired with each rifle and load, and the results averaged. With a Burris 3-9x Fullfield II scope mounted, the Kimber 22 Classic punched tight 3/8-inch five-shot groups with Remington Club Xtra ammo, 1/2-inch groups with Winchester Super-X Super Silhouette loads, 5/8-inch groups with Lapua Super Club and 7/16-inch center-to-center spreads with Federal Gold Medal Ultra Match fodder. Wearing Kahles' new American Hunter 2-7x36mm rimfire scope, my Anschutz 1710 D delivered 9/16-inch 5-shot groups with Remington Club Xtra, 5/8-inch groups with Winchester Super Silhouette, 1/2-inch spreads with Federal Gold Medal Ultra Match and tight 3/8-inch clusters with Lapua Super Club ammo. 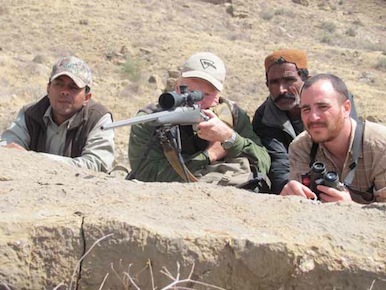 The Cooper Custom Classic was supplied with a Leupold Vari-X III 6.5-10x40mm scope. It produced 7/16-inch groups with Remington Club Xtra, 3/8-inch groups with Winchester Super Silhouette, 5/8-inch spreads with Lapua Super Club and snug 3/8-inch cloverleafs with Federal Gold Medal Ultra Match loads. All three of the rimfires I tested would make any fine rifle fancier drool. The $1,085 Kimber Classic 22 features a unique centerfire-inspired action in a AA Claro walnut stock with 18 lines-per-inch checkering. Barrel and action wear a matte blue finish. There's also a flossier Super America version available stocked in handsomely figured AAA Claro walnut extensively checkered at 24 lines to the inch and wearing a contrasting ebony foreend tip. The Anschutz 1710 D KL bears a world-famous name backed by a long string of international and Olympic accuracy medals. Its high-combed Monte Carlo stock with rollover cheekpiece, skip-line checkering and schnabel fore end underscore this rifle's European heritage. Anschutz offers other Model 1710 rifles with classic American-style stocks and either blued or stainless barrels, as well as less costly Model 1416 rimfires built on the Model 64 match action. But the Model 1710 D KL is the top of the Anschutz sporter line. It lists at $1,293. Cooper's Model 57-M Custom Classic is a true example of gunsmithing art. The sample I received wore a handsomely figured AAA walnut stock with imported ebony forearm tip, hand-crafted shadow line cheekpiece and an optional skeletonized steel buttplate that added $425 to the basic $1,995 price. The fine-line checkering followed Len Brownell's western fleur-de-lis pattern, with a graceful ribbon of unadorned wood flowing through the middle. The 57-M Classic standard model sports more modest checkering, plainer wood and sells for $995. If you appreciate fine rifles, find a dealer who has any--or all--of these excellent rimfires in stock. You have to hold them in your hands to truly appreciate the craftsmanship these top-grade .22s offer.